Chances are, you already have an ironing board somewhere in the house. You'll need it, of course, to press the seams of the doll clothes as you sew them. Sometimes, since you probably don't need a full size board, a smaller surface will do, such as a board that folds. Or you can use one of those square folding pads that quilters use. Either way, you will need something to put under your sleeve board and other pressing tools to protect the surface you are pressing on. I rarely use the full size board. It's way more handy to use my sleeve board since it is more "doll sized" anyway. Here is my sewing set up, above. Although this is a full-sized board, I just use the middle of it and use my other pressing tools for the actual pressing or ironing. 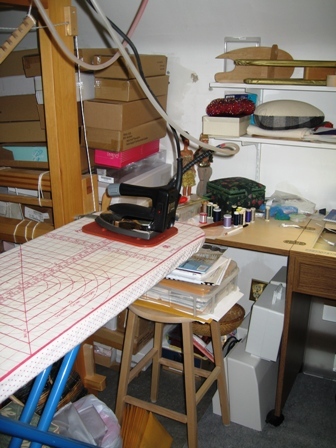 It is handy to have your pressing surface right next to your sewing machine--after all, you are going to press each seam right after you sew it and who wants to have to hike across the room every time? Put it where it's handy to reach.